Origin: Borneo, Java, Thailand, Malaysia. 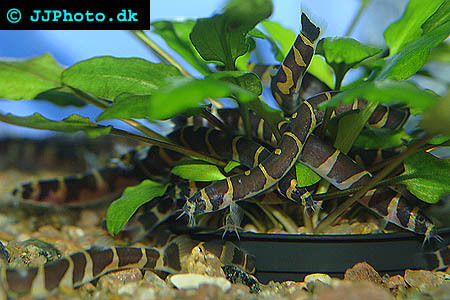 Company: Pangio kuhlii (Coolie loach) will suit any peaceful community aquarium. Aquarium setup: Pangio kuhlii (Coolie loach) Should be kept in an aquarium with fine sandy bottom substrate since they like to burrow. Providing plenty of hiding places will allow you the se your Pangio kuhlii (Coolie loach) more often. Feeding: Pangio kuhlii (Coolie loach) will accept most foods but they benefit greatly if you provide them with a varied diet including frozen and live foods. Breeding: Pangio kuhlii (Coolie loach) have been breed several times in aquarium but little is known as to what exactly is needed to get them to spawn.